A Polish adventurer involved in the rescue of a Scottish mountaineer in the Himalayas has completed the first descent of K2 on skis. Andrzej Bargiel's brother Bartłomiej operated a drone that was used to locate Aberdeen-born Rick Allen after he got into difficulty on Broad Peak. Allen, a highly experienced mountaineer, was in the region with Newtonmore-based Sandy Allan. Andrzej Bargiel skied from the summit of K2, the world's second highest peak. The historic venture, which required required extensive pre-planning of the route descended, was first attempted last year but had to be postponed due to dangerous weather conditions. Andrzej Bargiel dedicated Sunday's feat to 100th anniversary of Poland regaining its independence. Earlier this month, Mr Allen, 65, was returning from a solo climb to the summit of 8,047m (26,401ft) Broad Peak when he fell. 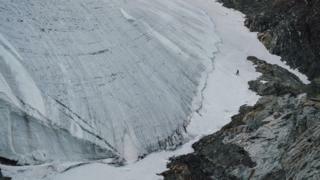 The Polish brothers' drone was used to confirm that it was Mr Allen, and then direct Sherpas and climbers to where he was to help him to safety.